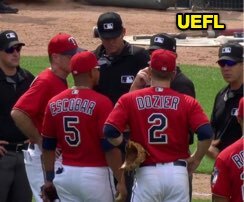 HP Umpire Ryan Additon ejected Twins 3B Eduardo Escobar (inciting a bench-clearing incident after warnings; QOCU) in the bottom of the 7th inning of the Rays-Twins game. With two out and one on (R3), Rays pitcher Diego Castillo balked home Twins baserunner R3 Brian Dozier before throwing low and inside to batter Escobar, resulting in a bench-clearing incident, after which warnings were issued. Following a called third strike to end the inning, Escobar engaged with the Rays dugout, resulting in a second bench-clearing incident and Escobar's ejection from the game. At the time of the ejection, the Twins were leading, 5-4. The Twins ultimately won the contest, 11-7, in 10 innings. This is Ryan Additon (67)'s first ejection of 2018. Ryan Additon now has 1 point in the UEFL Standings (-1 Prev + 2 AAA + 0 Irrecusable Call = 1). Crew Chief Jeff Kellogg now has -5 points in Crew Division (-6 Previous + 1 Irrecusable Call = -5). This is the 98th ejection report of the 2018 MLB regular season. This is the 48th player ejection of 2018. Prior to ejection, Escobar was 0-3 (2 SO) in the contest. This is Minnesota's 3rd ejection of 2018, T-3rd in the AL Central (CWS, KC 4; DET, MIN 3; CLE 1). This is Eduardo Escobar's first career MLB ejection. This is Ryan Additon's first ejection since September 15, 2017 (Don Mattingly; QOC = Y [BOO]).